Huge congratulations to Jaz and Tom on their gorgeous wedding at The Lawn, Rochford on Saturday 8th September. 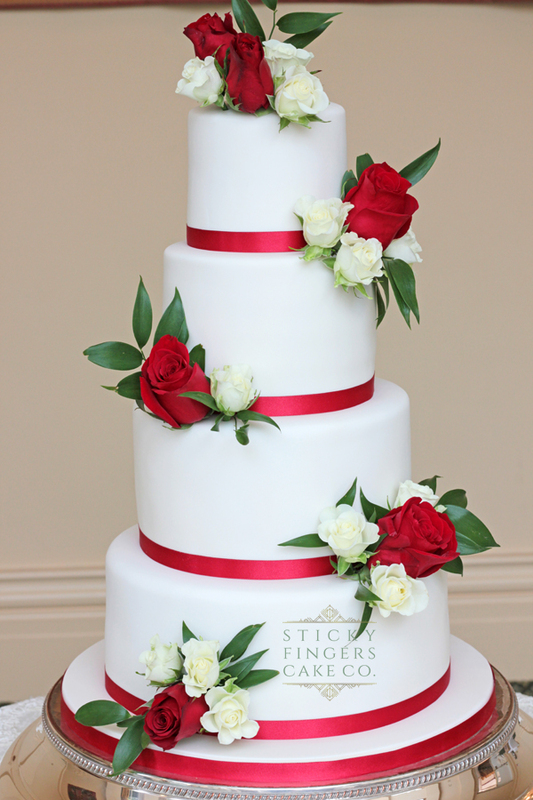 I really love decorating wedding cakes with fresh flowers and Jaz and Tom’s wedding cake looked stunning with the bright red and ivory roses with a splash of green from the foliage. They really stood out against the crisp white icing. The flavours they chose were traditional fruitcake on the bottom, followed by Red Velvet, Strawberry & Champagne and finally another traditional fruitcake on top which the happy couple were taking home with them to use at a later date. Sending you both all the best for a long and happy life together!